You don’t have to cross an ocean to be part of the work MAF is doing. There are many ways you can use your skills to help MAF reach isolated people with Christ’s love. Find out more at maf.org/advocate. Be a voice for MAF. Tell the MAF story in your community and help change the ending for isolated people by becoming an MAF advocate. around 5,000 feet. “If someone has not had the opportunity to fly that low, then you don’t have that magnitude of realization—how thick the forest is and how there are no roads. How you really are remote!” Had Renée and her team not been able to fly with MAF to these distant locations, the trip most likely would not have happened. They would have had to wait for dry season; their Congolese partners would have had to complete a survey of the roads. It could have meant a one- or two-year delay. “When we need to do timely work, we rely on MAF,” said Renée. This particular training happened last September, and the Congolese medical staff were able to start saving lives immediately. And they’ve already trained others to do the same. The impact has spread exponentially. 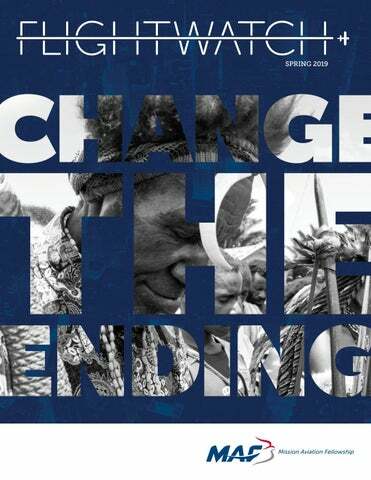 SEE WHAT YOU MADE POSSIBLE You changed the ending for isolated people around the world in 2018! Because of the support of people like you, MAF was able to share the love of Jesus with people living in some of the most remote places on earth. We are grateful for God’s provision and for all you made possible. Your support helped MAF not only meet—but exceed—its 2018 financial goals! Thank you for giving! There is a village high in the mountains of Papua, Indonesia, called “Apahapsili.” The name has several different meanings to the Yali people who live there, but today it most closely means “the place where we are uncovered by God.” Because of the gospel, the Yali who were hidden behind the mountain were found by God. But “Apahapsili” didn’t always mean this. Not long ago the word meant something very, very different. into their language. This process would not be fully completed until 2018.
how God lined up our skills and our passions and gifting with MAF.” At first, Peter thought he’d be a mechanic. He had a background in maintenance and wasn’t a pilot. But after taking his first flight lesson, he was hooked. “There were still huge barriers to overcome, such as the flight training,” explained Peter. “But we said, ‘God, if this is really what you want us to do, then we’ll keep going as long as you make a way.’ And He did.” When the De Winkles discovered that MAF had a program in Suriname, a Dutch-speaking country in South America, they felt another tug on their hearts. Both come from Dutch families, and Miriam grew up speaking Dutch. They couldn’t help but think: What if we go there one day? “It’s been amazing how God has directed us toward Suriname in our hearts, and towards the people,” said Miriam. Is God calling you to join with the De Winkles in blessing the people of Suriname through MAF? To join their team, visit maf.org/dewinkle. 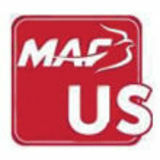 TECH CORNER AN MAF VOLUNTEER INNOVATION WILL ADD A SPARK TO THE FLEET! MAF airplanes take off and land in some of the most remote airstrips in the world. This means they must be uniquely equipped. And keeping MAF flying in remote jungles, deserts, and mountains often requires innovative approaches in unexpected ways. Take the MAF battery cart for example. A decade ago, when MAF began switching its fleet from piston engines to the much more dependable turbine engines, staff noticed poor starts that resulted from off-the-shelf batteries quickly losing power and creating weaker sparks. This meant the fire remained in the chamber too long. Over time, this causes the chamber to break down—getting hot and remaining hot for too long—and reduces its life expectancy. Replacing a chamber can cost $200,000. So Gerald Dafoe, a former MAF pilot in Brazil who now serves as an MAF volunteer, and other volunteers at MAF’s headquarters in Nampa created the MAF battery cart to solve this problem. The cart includes two 6-volt batteries and two 8-volt batteries, as well as a charge monitoring system that was also developed by MAF. The monitoring system allows charger performance to be viewed remotely—either at the Nampa home base or from a volunteer or staff member’s home. Battery charging carts may revolutionize response times, reach, and resources for years to come. They fill a specific niche for our hangar crews and pilots not currently addressed by typical flight equipment. And it’s a niche that goes back to the very basic function of the airplane battery— creating a hot start. Many MAF flights aren’t long enough for the engine to cool appropriately, which shortens the life of our aircraft. The carts lengthen the life of the chamber, which allows other internal workings to see increased lifespan. In addition, the battery carts themselves will last 8-10 years as compared to 18 months for traditional, onboard batteries. By using the onboard battery half as often, those batteries will last 50 percent longer. “We must be good stewards—even, or perhaps especially, when we discuss aircraft,” said Gerald. Currently, the first cart is being used at the MAF hangar in Nampa. The plan is to get them to the field bases once funding can be raised to build others. JOIN US IN PRAYER Pray for MAF human resources personnel in the U.S. and around the world, that God would direct their hiring decisions. Lift up 10 new MAF staff who were accepted in January. Ask the Lord to grow their ministry partnership teams. Continue to pray about the Ebola outbreak in eastern DRC—for protection over our staff and our partners, for those affected, and for containment. Lift up the Trio and Wayana children of Suriname who will now experience the Bible in their own language. May the Lord grab hold of their hearts and may they learn to walk with Him forever. Pray also for those who are trying to raise money to print and deliver more copies of these scripture translations. NEWS BRIEFS ‘CHARLIE BROWN’ ON THE MOVE In previous issues of FlightWatch we told you about two Cessna 185 floatplanes, PK-MCB and PK-MCD, that retired from MAF service last year. Well, they are on the move again! PKMCB, “Charlie Brown,” will be on-loan to MAF Switzerland, who has arranged for it to be displayed at the Swiss Museum of Transport. By summer the airplane should be installed on a large pond with islands that represent various MAF locations around the world. Interactive features include paddle-boats (“airplanes”) for visitors to carry out “missions” at each country, sound effects, and graphic panels telling about PK-MCB and MAF. PKMCB will be on the pond for at least a year. After that, it will likely move inside the museum building for several more years. Charlie Brown’s counterpart, PKMCD, will be on display at the Moody Bible Institute in Spokane, WA. RESTORING WOMEN’S LIVES MAF flew Dr. Tim Rice and Dr. Shannon Potter to the Vanga Evangelical Hospital in the DRC in early December, where women from all over the area came for life-changing surgeries to treat obstetric fistula. MAF pilot Stephen Hale then flew to the Kikongo mission station to pick up five women and bring them to Vanga for the surgery. The ladies’ flights were paid for by the Vanga-Kikongo Project, funded by MAF donors to support medical and missionary flights to those two locations. The cost of the surgeries was covered by Americans who gave through CongoHealthConnection.org. CHILDREN’S BIBLE DEDICATIONS MAF Suriname, an affiliate of MAF, recently delivered children’s Bibles that had been translated into the Trio and Wayana languages. Jacoline Bijkerk, wife of MAF program manager MAF BATTLES EBOLA DESPITE Andy Bijkerk, spearheaded this EVACUATION project, which took four years to MAF’s team in eastern Democratic complete. These two tribes had no Republic of the Congo (DRC) was biblical material for young children evacuated from Nyankunde after an (lower elementary grades), and now Ebola patient was identified at the they have a beautiful picture-book local hospital just before Christmas. version. Andy spoke at four Trio village The team relocated to MAF’s Uganda dedications and quoted Deuteronomy base, from which our pilots continued 6:6-7: “These commandments that to transport vaccines, medical I give you today are to be on your personnel and supplies, and sanitation hearts. Impress them on your children. equipment into the North Kivu Talk about them when you sit at home province. The MAF team returned to and when you walk along the road, Nyankunde at the end of January, after when you lie down and when you get no more cases had been reported up.” Photo by Andy Bijkerk. there for 21 days (the incubation period). Photo by Dave Petersen.